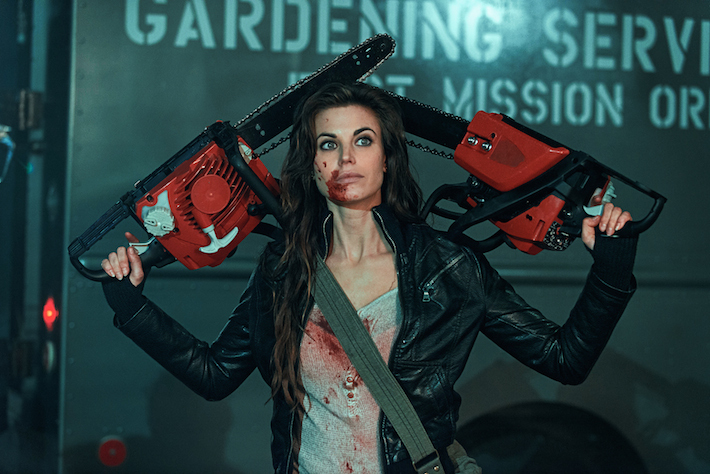 I really wasn't expecting much when sitting down to watch Dead Rising: Watchtower, after all not only was it straight to video but it is based on a video game and movies of games are generally terrible (House of the Dead and Doom springs to mind). For once however it seems someone has actually played the source material as this is chock full of references and nods. While I can't say this is a particularly amazing film at the same time nor is it a bad film, after a long day of work this was the perfect thing to put on and veg out to. I enjoyed watching this and don't feel like it was a near two hours wasted while at the same time I wouldn't go out my way to recommend. From the very start there are so many references to all the games. 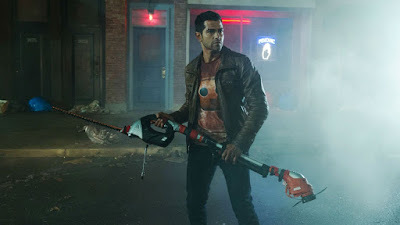 Many tools and other items are used as weapons, Chase uses a billboard as a battering ram, a toaster as a projectile, and him and his group all end up duct taping items together so that you get such things as an electrified pole and a custom made sword, Chase even puts a traffic cone on a zombies head at one point. Elsewhere there are more obscure Easter eggs, at a pawn shop there is a Frank West statue (that I believe was a collectible in the game), while Chase wears a T-Shirt that has a yellow Servo-Bot head on it (also from the games). One of the undead is wearing the same biker jacket as the main character of Dead Rising 2, while in a sequence at a gang's base one of the gang members is seen playing Dead Rising 3. The best reference to the series is the character of Frank West played fantastically by Rob Riggle, his scenes of him and a TV reporter are intercut throughout and he just gets better as he goes along. He is arrogant and brash and references his time in Willamette Mall (the setting of Dead Rising) commenting that after fighting zombies you have to go and recharge your stamina, and even does his meme-tastic "I've covered wars you know'' catchphrase that made me smile. The plot is as generic as they come but feels very much of the universe, the main story being Chase's efforts to prove it isn't a new strain of the zombie virus and so it would be ok to evacuate all non undead still trapped in the quarantine zone. To add spice to that and again being a nod to the games is that there is a wild biker gang led by Logan (a great turn by Aleks Paunovic) whose goals run counter to Chase and keep popping up as a reoccurring antagonist, he is the film version of the games psychopaths; humans who have been driven mad by events. Meanwhile the sub plot involves Jordan at the military outpost who is secretly investigating the true events of the outbreak and trying to find a way to rescue Chase. The TV news channel show with Frank West are almost a commentary on the rest of the film though it does seem a bit weird that over the 24 hour period (roughly) that the film takes place in Frank and the news woman never leave the air. Any more of Frank and it would have been too much, I appreciate he was limited to a side character. None of the acting aside from Riggle and maybe Paunovic is particularly memorable, no one does a terrible job, there are a few dodgy characters, for me Maggie; the woman looking for her now zombified child had a role that was a bit too soppy and weird. The good guys are likable but in that movie style way, not due to the quality of the acting, more how they are portrayed. It was cool to see YouTube star Harley Morenstein (Epic Meal Time) in a bit part as one of the gang members. 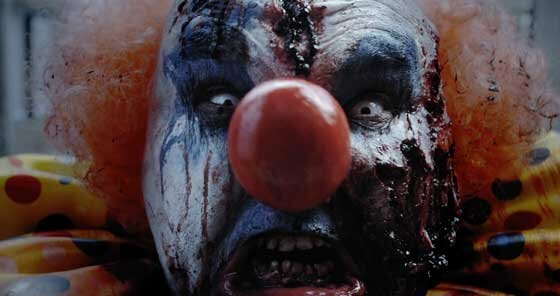 The zombies are decent enough in look, odd coloured contact lenses and blood being the main way they are identified as such. For the most part they are slow shambling corpses but you get the odd stand out one such as a clown armed with a fire axe, and a cop who is still able to just about fire his gun, there is also a zombie child which is always good to see. There is some violence towards these ghouls, early on a propeller fan is flung into the head of one, at one point a zombie is sliced clean in half, later Chase rips off an arm and uses it as a weapon, while my favourite death involved one of the walking dead which a van rams into, as the van reverses the zombies head becomes stuck in the grill and gets ripped off the shoulders. On the human side the deaths are much more censored, people do get ripped apart but this usually signifies a scene change, while winch inducing violence such as a grass cutter to the back seems to have minimal impact. 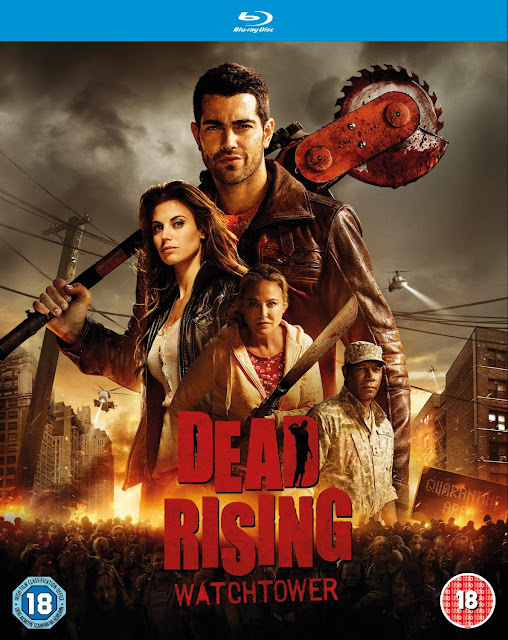 This all looks pretty high quality for what it is and aside from a later poor looking explosion the effects throughout were not bad at all, the soundtrack was not really memorable at all but then Dead Rising has never been known for its music. If your a fan of the games there is a lot to like here, while I didn't think this was a good film I had a lot of fun spotting all the references. Nor is this a bad film either and while the middle ground usually leads to snooze-ville I did enjoy watching this which is a big plus. I'm not going to recommend Dead Rising: Watchtower but I'm not going to advise against it either, far far worse zombie films out there so you will get some enjoyment at least from this.